Upper East Tennessee Human Development Agency (UETHDA) needed to quickly share information with country residents. The boards display real-time information about housing and UETHDA events in 8 community centers. Project included Xhibit signage systems, content management software (CMS), content integrations and professional services. UETHDA saw a marked increase in community engagement and employee satisfaction. 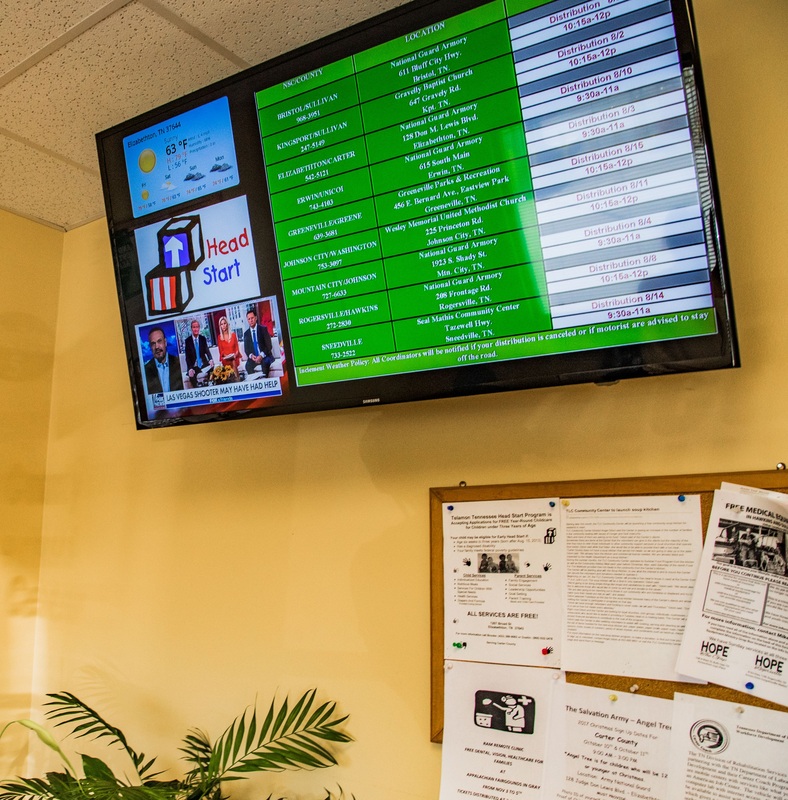 households in Tennessee, has implemented a digital signage network powered by Mvix in 8 counties. The displays in the 8 Neighborhood Service Centers are empowering residents to build better communities by providing easy access to important information and community resources. The screens – which are networked and remotely controlled – display information about available programs, event listings, live TV, curated UETHDA YouTube videos, an album of completed projects, and other supplemental information such as weather, time and inspirational quotes. The primary goal of UETHDA is to support individuals and families in low-income communities by providing resources to combat poverty and improve the quality of life. Guided by their philosophy of “Helping People, Changing Lives,” UETHDA has been a model public agency for the community, state and nation. For over 50 years, the agency has served eight Tennessee counties, each with a Neighborhood Service Center to provide the tools, education, and support to improve the quality of life for its residents. foundation for sustainable economic and social growth in the community. In its 50 years history, UETHDA has encountered countless changes and experienced major transformations. Their basic mission, however, of helping individuals and families to strengthen and develop have remained unchanged. UETHDA largely attributes this success to their flexibility to adapt to shifting situations. UETHDA needed a coordinated messaging system that would distribute important information to its residents in an efficient and effective way. The 8 service centers used notice boards for communication. The boards however would often go unnoticed and all of the paper created a lot of waste. The notice boards also limited the type of content UETHDA could display. Although they had automated event calendars and YouTube videos for educating residents, they had no effective method of delivery or platform for display. Essentially, they needed a solution that could easily and remotely distribute multimedia content to each of their 8 locations. The system also needed to support multi-user access to enable collaboration between the 8 counties. Mvix deployed a digital signage network spanning 8 counties and reaching thousands of residents. The Mvix platform offered remote management and integration with content apps such as YouTube,dynamic weather, broadcast video, automated calendars, and other infotainment options. The platform also offered advanced scheduling and multi-user access to enable collaboration between different service centers. 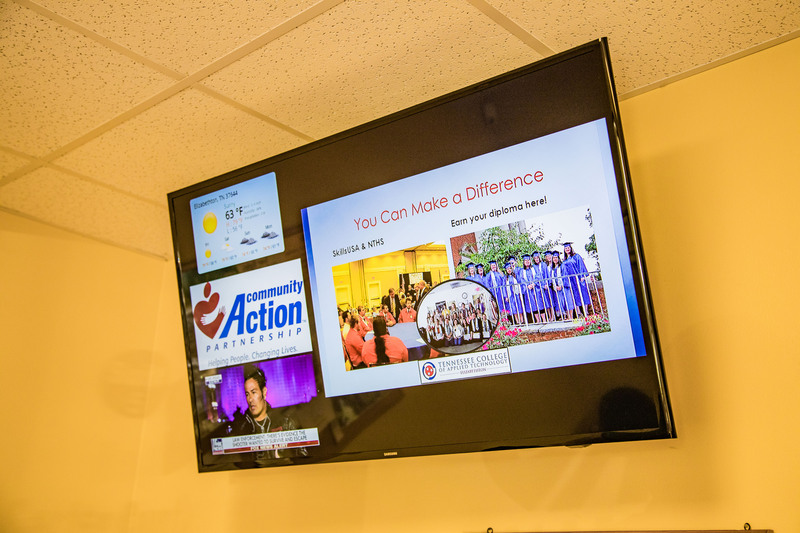 Each of the Neighborhood Service Centers has a networked screen that displays information about their available programs, event listings, live TV, curated UETHDA YouTube videos, pictures of completed projects, and other supplemental information such as weather, time and inspirational quotes. The screens are located in lobbies with high traffic and high dwell times. UETHDA chose to keep the notice boards adjacent to screens for display of information that doesn’t change often. All screens are remotely managed from the main administration center. This allows the administrators to instantaneously push out crucial, time-sensitive information. UETHDA has noted improved retention of the shared information by residents and increased engagement from the offered programs. The Neighborhood Service Specialists have noticed an increase in the number of inquiries regarding their services, support outlets and programs. They have also recorded improvement enrollment in offered programs. The signage has also reduced the workload of the Neighborhood Service Specialists. Basic information and instructions regarding services is displayed on the screens so specialists can dedicate their time and efforts on creating solutions for the community. The digital signs are also used to promote services and events hosted by UETHDA partners. The goal is to expose the residents to a wider support network. The new displays take up a fraction of the space and resources that the previous notice boards did, and have significantly reduced paper waste. At Mvix, our love for technology drives who we are and what we do. For over a decade, we have been a leading provider of content-rich digital signage solutions that create memorable digital experiences in corporate offices, healthcare facilities, school campuses, restaurants and more. Our focus is on cost-effective, feature-rich, cloud-hosted solutions that, coupled with our engineers and creative team, build digital signage networks that turn browsers into customers and employees into brand ambassadors, all while enhancing brand awareness. Our software, XhibitSignage, recently won the InfoComm 2017 Best of Show Award – Digital Signage. Upper East Tennessee Human Development Agency (UETHDA) is a social services organization dedicated to providing the education, tools, and support to build stronger communities in northeast Tennessee. From its humble beginnings consisting of Conduct and Administration, and a summer Head Start Program, UETHDA has grown to an annual budget of $16 million and serves more than 22,000 households.